Milla Villa sits in a prime hillside location, overlooking a spectacular scenery made up of lush foliage, rugged coastlines and clear blue skies. 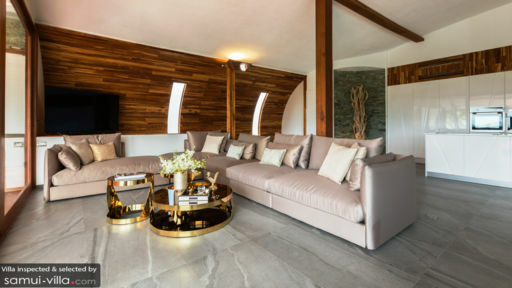 Ideally kitted for eight, the villa features multiple indoor and outdoor living spaces, a glimmering infinity pool and a full range of modern amenities. An while the environment is private and serene, you’re just within a quick drive to the beaches, local amenities and key tourist attractions in North Samui. Eight guests are comfortably accommodated in four bedrooms. Just like the main living spaces, the bedrooms are decked out in neutral tones and modern furniture, along with unique ornaments - like accent chairs and dreamcatchers - that catch the eye. All bedrooms offer access to a terrace, along with a safe, lounge area and private en-suite equipped with a bathtub and rain shower. Two of the bedrooms are fitted out with king beds, while the remaining rooms are furnished with queen beds. 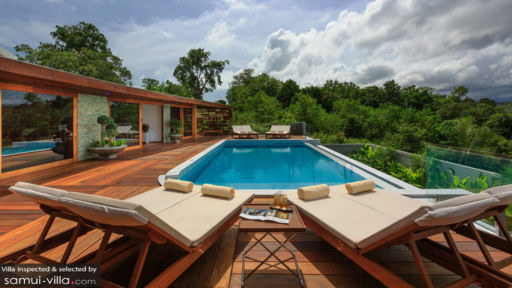 A wooden pool deck frames a sparkling infinity pool overlooking a picture-perfect tropical landscape. When you’re not cooling off with a dip, you’ll be basking under the sun upon the poolside recliners or relaxing with a drink at the outdoor lounge. Glass revolving and sliding doors bring the outdoors in, and ensure that the outdoor and indoor living spaces transition seamlessly. The interiors are modern and clean-lined, with neutral tones, contemporary furniture and a selection of stand-out home accessories - like an ocean-inspired wall ornament and statues of Chinese warriors. The main living area comprises of an eight seater dining set, fully equipped kitchen and a lounge outfitted with plush designer seating. Amenities like an espresso machine, wine cellar, bar, sound system and inviting lounge areas create a perfect setup for hosting. Milla Villa offers child-friendly amenities like a baby cot, high chair and child minding services. Airport transfers and a daily breakfast service are included with your stay. Amenities available at additional cost include personal chef service, villa pre-stocking, personal driver service, vehicle rental, laundry service and in-villa massages. 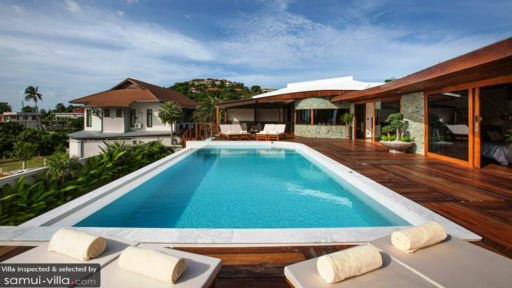 Milla Villa is located in Choeng Mon, North Samui. You’re about seven minutes’ drive away from Choeng Mon Beach, a family-friendly attraction with quiet shores, shallow, kid-friendly waters and a variety of water sports and activities. A whole host of dining options abound in the vicinity. There’s The Larder, where gourmet fare like slow-cooked pork belly, curried lentils with Scotch duck egg and mussel and clam chowder are served up in a cosy wood-dominated setting. Head to Supattra Thai Dining for some of the tastiest plates of local dishes on the island, or SALA Samui Restaurant for seafront dining. Pepenero and Salefino are great options for Italian food. Samui’s iconic cultural site, the Big Buddha is less than 10 minutes’ drive from your villa. Combine your trip with a visit to the nearby Wat Plai Laem - a colourful temple compound with a striking 18-arm Guanyin statue. Fisherman’s Village, a hub with numerous dining, shopping and nightlife options is 15 minutes’ drive away. While you’re in the vicinity, make sure to check out its Friday walking market (also known as Fisherman’s Village Walking Street). It’s reputedly the best walking market in Samui, and features an extensive selection of street food stalls, souvenir stalls and live performances. Six Senses Spa, located about eight minutes’ drive away offers incredible spa treatments in an ultra-luxe setting. For a different kind of relaxation, head to The Yogarden Samui, where you can take your pick from a wide-ranging array of yoga, fitness and meditation classes. Island Organics is a great place to try your hand at cooking your favourite Thai dishes. It’s about a 17-minute drive from Milla Villa.